Call it “Americana” if you need to put a handle on the music, because the songs are certainly steeped in American musical traditions. The Midwesterners have earned a reputation for rollicking, twangy performances, but on this latest album, they pull out all the stops, from the opening manifesto, Keep The Dance Floor Full, to the full-throttle closer, Keep Your Motor Oiled. This is definitely NOT background music. 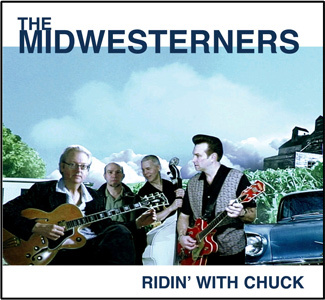 When Richard sat down to write some new songs, “the first one that came out was Ridin’ With Chuck. There were these other ‘Ridin’ With…’ tributes to B.B. King and Bob Wills, and I thought it was time for an homage to Chuck Berry. He’s been a huge influence on me and a lot of other guitar players. Then I realized that I had all these ideas for songs about cars and guitars. I added some newer songs and the pieces started to fall into place.” All songs on the CD are originals, except for a cover of the Chuck Berry classic, You Never Can Tell.